Okay, even I can’™t read ALL the time, so I’™m guessing that you folks might voluntarily shut the covers from time to time as well’¦ What else do you do with your leisure to pass the time? Walk the dog? Knit? Run marathons? Construct grandfather clocks? Collect eggshells? Although I do love reading and always like to have one book or more on the go, I do like doing other things too. I’m later than usual writing Booking Through Thursday as Thursday morning I go to the course (it’s only for 6 weeks) on Dante’s Florence, so you can guess from that that I like art history, Florence, Italy and history. I like to visit anywhere with historical connections, castles, stately homes, churches, museums, etc etc and take photos. I’d like to learn more about photography and improve my photos. I’ve written before that I do cross-stitching, but recently I haven’t done much – too much reading and writing. I suppose writing does take up more of my time now than it used to, so perhaps I should say writing. Then there is family history – that has been very time consuming recently. I like going to the theatre and cinema too. I have several Keep Fit type DVDs but the last one I bought has proved to be really hard. It’s Strictly Come Dancersize. I love the show and was so impressed with the fitness of all the dancers and celebrities that I bought the DVD. It is so hard. First of all you have to be able to dance a bit before you can start to follow the routines. Karen and Erin go through the moves and I think I’ve got it until the music starts and some of it is fast! They go through the Salsa, Jive, Quick Step Samba and the Cha Cha. I thought I knew how to jive at least, but no I couldn’t do it – the quick step and the salsa aren’t too bad. I shall persevere. Also to keep fit we do a bit of walking, although we’re really only fair weather walkers. Yesterday was a beautiful sunny day, although a little cold, so we did get out and walked to the lake shown in the blog header. 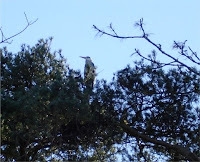 There were swans, ducks and Canada Geese on the lake and as we walked up a heron flew up onto its nest at the top of one of the tall trees at the side of the lake. Being with the family is one of the best ways to spend leisure time. We have three grandchildren and we love doing things with them, or just being with them. So for example, we’ve been on farm visits, parties, ten-pin bowling, which I love but am terrible at, watching the ballet. Of course one of the most enjoyable things to do is going out for a meal, although after watching Gordon Ramsay’s Kitchen Nightmares progammes I’m not so sure I should! I read some reviews on the Strictly DVD and decided I wouldn’t attempt it. One more exercise tape to languish on the shelf, I thought. I do enjoy your posts about visits to historic places. Melody, I wish I could cross-stitch and read at the same time.Geraniumcat, I had another go at the DVD this afternoon at the Cha Cha Cha and am just beginning to get the steps, I don’t want to give up. I can do the warm-up and cool down! You’re more honest that I was; I’m only a fair weather walker as well. Bird watching and walking — two lovely ways to spend one’s time. Happy BTT. This week’s BTT question was really fun. It’s interesting to see what everyone likes doing with the rest of their free time. I’m just such a boring person. Everything seems to be book realated. I used to cross stitch, but I only have time for a limited number of pursuits and I have a hard time seeing the fine stitching anyway now. I do like to walk on my treadmill and I have some yoga DVD’s (Yoga for the Rest of us).